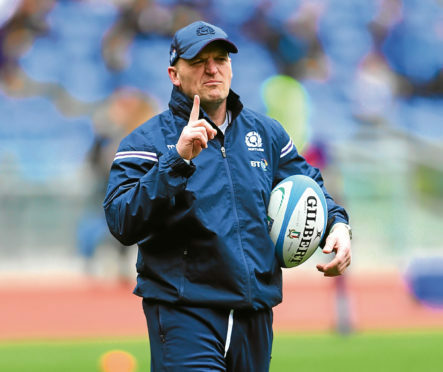 Gregor Townsend, head coach of Scotland gives his team instructions during the warm up prior to the NatWest Six Nations match between Italy and Scotland at Stadio Olimpico on March 17, 2018 in Rome, Italy. The sports might be different but the script tends to follow a predictable pattern when it comes to rugby and cricket in Scotland. There are hints of brilliance interspersed with collapses into mediocrity; the feeling something good is just around the corner, as the prelude to our players heading down a cul-de-sac of vulnerability. Take the Six Nations championship, for instance. The Scots were like the little girl in the nursery rhyme – when they were good, they were very good, but when they were bad, they were horrid. Enough attention has been focused on the disparity between the invigorating invention of Gregor Townsend’s side at home and the team’s often patchy, error-strewn performances on their travels. To that extent, you could argue it was vindication of sorts that they played so badly for long periods of the contest in Italy and still scraped a last-gasp 29-27 victory through the boot of Greig Laidlaw. There is no denying they were one of the most thrilling sides in the tournament, but the reality is that third place was nothing to get excited about. Yes, the win against England was a terrific example of their attacking prowess but, as France and Ireland subsequently demonstrated, Eddie Jones’ men have gone backwards in the last couple of months. Wales, too, were no great shakes but still managed to finish above the Scots. And, in 2019, in advance of the World Cup in Japan, Townsend’s personnel will have to journey to Twickenham and the Stade de France. There will be no Italian-style heists at these venues unless they cut out the unforced errors. The cricketers, meanwhile, had been making superb progress in their efforts to qualify for next year’s World Cup. Aberdeen players Kyle Coetzer, Matt Cross and Michael Leask were all pivotal figures in the Scots’ wins against Afghanistan, Nepal, the UAE, Hong Kong and their tie with long-time ICC Full Members Zimbabwe. But, on Sunday, when it mattered, and they had the opportunity virtually to seal their place in the showpiece event, the Scots messed up in front of a global TV audience. Chasing Ireland’s 271, they seemed to be cruising at 94 for one. Around half an hour later, they had lost five wickets as the wheels fell off. They now have to meet and beat the West Indies, Chris Gayle, Marlon Samuels et al, tomorrow, or they will be sitting out the action in Blighty next summer. They haven’t been helped by the ICC’s ridiculous decision to reduce the number of World Cup participants to just 10. But they have to forget about that. It’s the same for Ireland, Afghanistan and the rest. There is a job to be done and a wonderful prize on offer. It really is all or nothing. Nearly doesn’t cut it in professional sport.